Yesterday I launched Jeub’s Guide to Speech & Debate, the preorder deal, at least. The 5th Edition comes with a free curriculum alongside it. I can’t decide which one I like better: the book or the free curriculum. The accompanying curriculum is awesome! Being impressed is easy. But how do you teach this stuff? See, I’m pumped that parents and teachers want their kids to jump into the world of forensics. The book attempt to make it easy, but over and over I heard people say how they wanted a curriculum—something that just told them how to do it. That’s what this does: it serves to make speech and debate easy to understand, easy to get involved, and easy to pull others into this great community. I had these three purposes in mind when I wrote this curriculum with the book this time around. First, the ease of it all. The seven lessons I wrote attempt to make speech and debate easy to understand (the curriculum is subtitled “Seven Lessons to Speaking & Debating.” There are several leagues and organizations students can participate in. After adding all the wildcard and consolation events available in the leagues, there are likely dozens of different speech events and debate formats. 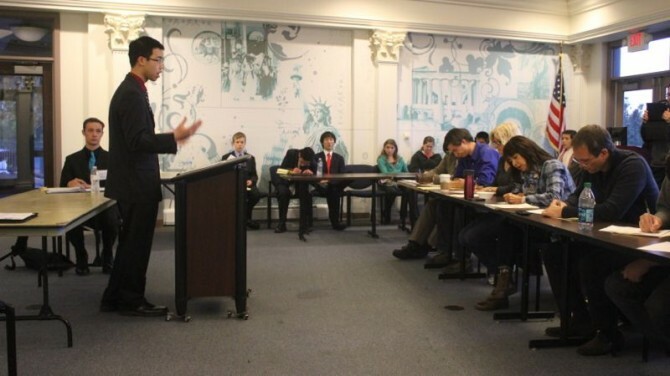 Jeub’s Guide to Speech & Debate narrows focus down to the three major leagues and the events available in each of them. By the end, teachers should have few stones unturned in understanding what is expected of them and the opportunities available to their students’ first competition. Second, the confidence to get involved. 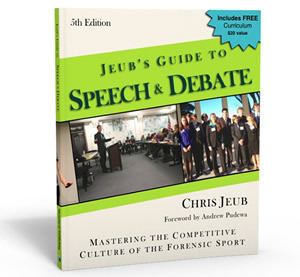 You may have already read the introduction to Jeub’s Guide to Speech & Debate, at least the 4th edition. Folks who know my story know that I had some humble beginnings as a debate coach with no prior knowledge to the extracurricular activity I was thrown into. It has been nearly 20 years since then, and today I’m glad I experienced the whiplash of getting involved. I remember all too well how lost I was, and if anything the curriculum – written in seven lessons – is meant to make it simple and easy to understand. Third, pulling others into the community. The fact that this curriculum is laid out in seven simple lessons that picks apart the details involved with speech and debate competition, I hope it makes it possible to spread the word and get more people involved. Like any economy, the more active participation, the more exciting things are, and the more attractive it is. I have little doubt that once teachers get rolling—with a team of other teachers and coaches or on their own—word will spread on how awesome the speech and debate community is. Seriously, after finishing the curriculum, I thought perhaps I shouldn’t have given it away. It’s worth quite a bit. Ah well, the marketing plan is behind me, and this curriculum comes free with every book. Preorder today!